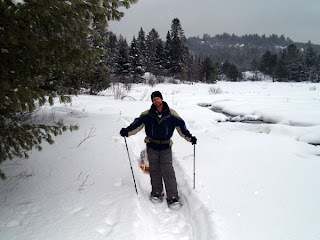 During the weekend of January 31st to February 2, 2009 I was invited to join Markus of Mark in The Park, Mike B of Algonquin Adventures and Jeffrey M of the best Algonquin Map in the world on a two-night trip to Fork Lake, accessing via the Visitors Centre of Algonquin Park. To say I was excited and honored to be included was an understatement, and instantly accepted the invitation. The drive up was rather uneventful, and took about 3.5 hours in total. We experienced some gusty winds, some snowy patches along the way, and temperatures in the minus 25 degree range. Normally such conditions would have me a bit worried about camping in the interior, but this weekend would be different, as we were going to be staying warm ala Markus’s military style hot tent. It was an early evening that night, and by midnight I was off to bed. The next morning we awoke at around 7:00 am, giving us plenty of time to wake, clean up, load up our gear, have breakfast and make the 45-minute drive from the cottage to the Park's West Gate, where we were to meet up with Markus and Mike B by 8:30am. Everything was going as planned, and we were out the door by 7:45am. For those who haven't read my blog before, to access my cottage one must take a privately maintained, hilly and rather curvy road into the forest, for a good 15 km off highway 11. While freshly plowed, the road was like ice, and as Murphy's Law would have it, we made it all the way to within 4 feet of the "last tricky spot" where my car lost all momentum, and began to slide backwards. While the reverse sliding was slow, within 5 seconds the car had slid and twisted perfectly perpendicular to the road with my front end gently pressed into one side of the road's snow bank, and my car's rear in the other. "S#%t" I thought, "We'll never make it now!!!" Luck was on our side however, for while perfectly blocking the road, we were stuck in a portion of the road that was on a rather steep hill. With the roads incline in our favor, and not being too badly packed into any snow bank, I asked Jeffrey to give us a push in the front, seeing if the combination of his push and the engines throttle, might be enough to squeeze the car out of its predicament. Who would of thought, but on the first try we managed to twist the car around 180 degrees from our original path of travel. This enabled us to backtrack driving forward to the previous fork in the road (a drive of a few kilometers), turn around and give the drive a second attempt at getting out; to which we did with no problem at all.... I guess practice does make perfect. Man not only were we lucky to be out of a very sticky situation, but we were only delayed by about 30 minutes. This meant for a very fast breakfast at McDonalds, oh how I love McD's "Egg McMuffins," one of my little guilty pleasures in life. By 9:15 we arrived of the Park's West Gate, to acquire our permits. We learned from Kevin, the attendant on duty that Markus and Mike had come and gone, but knowing their plan we carried on into the park. Another 30 minutes passed, and we were at the Visitor Centre's parking lot, and as luck would have it Markus and Mike were just about to head out. 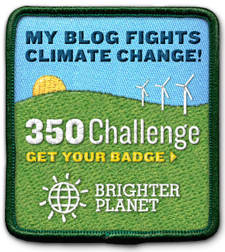 Wow ... we made it!!! Markus and Mike loading up. In about 20 minutes, Jeffrey and I had our sleds packed, winter clothing on and were ready to hit the interior. Our journey would take us up a short hill by the South Parking lot of the Visitor's Centre, and then across an open field, which I suspect is the septic tank field for the Visitor's Centre. After a few steps we all knew we would be in for a hard pull though, for the snow was well over 3 feet deep, and very fluffy. Markus and Me heading to the top of our first hill. After a short trek we reached the top of the large hill that gives the Visitor Centre's observation deck its a magnificent view, and started to make our way down the steep decline. For the first part of the journey down, Markus took the lead and about mid way down I took over as trail breaker and lead our party down the second portion of the hill. While tricky to maneuver, gravity was on our side, and I made it down with little problems. Unfortunately, it was as I reached the bottom that my first mishap would occur. You see, at the bottom of the hill were several fallen trees. Unfortunately due to the very deep snow the trees had been completely buried, leading me to believe that I would be walking over fairly even and flat ground. Wrong! Within seconds of my foot reaching what I thought was safe ground, I realized I was landing on what turned out to be a "sink hole" in between the trees, and I dropped about 3 feet into some very deep and fresh snow, landing flat on my back. While I was uninjured, it did take a lot of effort to get out, especially as my sled had followed me in. Markus was next to follow, and he too got sucked into the hole. His landing was a bit more gracious then mine though, and seeing him in the snow reminded me of a man lazing in a hammock, and so our first obstacle was named "The Hammock". Jeffrey and Mike followed soon after, and with a good team effort, we got all the sleds through, even though I believe each of us got to "rest" in the hammock at least once. Having reached the bottom of the hill and having passed over the hammock, we started our trek through the boggy region east of Fork Lake, which would bring us towards the shore of Fork Lake, and hence to our campsite in the marshy region separating Fork and Norway Lakes. After about 100 feet we knew the snow was too much for breaking a trail while pulling a sled, and so Markus and Mike left their sleds to break the trail to our site, while Jeffrey and I pulled our sleds to further pack down the trail; a good call Mark & Mike! Markus contemplating our next move. Once at camp Jeffrey and I started digging the foundation for our hot tent, while Markus and Mike returned for the remaining two sleds. Feeling guilty though, Jeffrey and I ended up meeting Mike and Markus mid way back, offering some help in getting the rest of the gear to camp. Upon getting all our gear to camp, and having a chance to catch our breaths (what was originally planned to be an hour hike, turned into a three hour one) we began the task of setting up camp. With a great team effort, the hot tent was up in about 30 minutes, the stove started up, and about an hour later we had a good supply of cut wood for the stove, the burs for the tent floor in place, and our bedding set up. In short, it was time for a drink! Our "Home Away From Home." By this time, while exhausted from all the hard work, I got caught up in the reality of being back in the park, only this time winter camping in a hot tent, which left me feeling like one of the luckiest people alive. The setting was so magical, so vivid and in so many ways so wild. In fact, during that weekend, while the temperatures would drop to about minus 30 that night, at no time did I ever feel cold, or for that matter "really tired" as the beauty of my surroundings was so aww inspiring, and hence so energizing. After a few beverages and some great chat, dinner was started, and we enjoyed the first of what would be a weekend of excellent meals. Our first nights dinner menu was Markus's homemade chilly which went down wonderfully. After a few more beverages, photos, stories and chat, it was off to bed, and by 11:00pm that evening we were all fast asleep. For the record, prior to bed time the hot tent reached temperatures in the mid 30's or approximately 55 degrees warmer then that of the outside. WOW the heat you can generate with such a small stove. The following morning, the fire had completely died out. Interestingly enough, while the temperature inside the tent had dropped considerable it had not dropped below about 8 degrees, while outside it was a cold minus 30, that evening. The following morning we were all up relatively early, with Mike being the first to awake; Mike also braved the cold and got the wood stove going again in the morning, so a warm thank you to Mike for that! That morning we also enjoyed some fantastic homemade cooking in the form of some egg/spinach patties and pre-cooked pea meal bacon on English muffins that Mike's wife Laurie had made for us (all we had to do was heat them up); I still have to get the recipe off you Mike (or I guess Laurie) for they were excellent and again Laurie thank you! After breakfast we were off for a day of trekking around Fork Lake. Our journey took us across Fork Lake to the lakes lone island campsite. This was followed by an excursion to some frozen waterfalls on the lakes north shore, followed by a fantastic "lake-side lunch" of freshly cooked sausages and buns, near the Fork Lake-Jean Lake 335 portage, again curtsy of Mike. In all we spent bout 6 hours out exploring the lake, and even got to see some fresh moose tracks crossing portions of the lake in and out of the neighboring forest of the lakes south shore. While slushy at times, making for a few scary ice crossing moments, the ice was very thick and covered by at least a foot of fresh loose powder over top. Since the moose were able to cross, we figured it was safe for us to do the same. 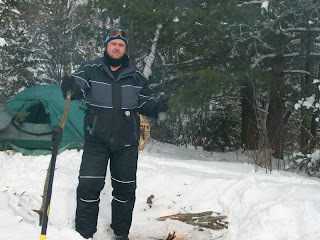 Later that evening we all went and visited Shawn of North Bay at his campsite to see his cold camp set up. Man is he efficient in the woods, for he had a fantastic wood supply accumulated, he had set up his tent and sleeping gear arranged, he had a warm fire going, and was getting ready for dinner. We chatted a while, and then invited him back to our camp for dinner, to which he declined. Getting hungry, we returned to our cooking, and stayed warm in the hot tent. Later that evening I went back to check on him, and again offer him some warmth and a dinner, but he was already set for the night, so we chatted a bit longer, and then I returned to our tent for the night. After dinner, an excellent beef and venison stew, the four of us enjoyed a few more drinks, and then were off to sleep by around 11:00pm. That night the weather was considerably warmer, and so the tent remained very hot that night, with the temperature reaching a high of plus 30 at one point that night. Prior to bed though we made what I believe was an Algonquin Adventurers first, for you see we posted a "hello" from our tent to the outside world via my iPhone in a thread on Algonguin Adventurers forum. The next morning Mike was up at a very early 3:00 am, while the rest of us "slept in" until nearly 9:00am. Today's breakfast was Jeffrey M and my responsible for providing to the group. (A very fair trade, considering how well we had eaten so far that weekend.) So after a bit of fumbling we got some freshly pressed coffee server with Baileys out to everyone, while we cooked some fresh bacon and heated some beagles for us to enjoy for our last meal at our camp. It was as we were enjoying our morning coffee that Sean of Ajax made his way to camp, as he had decided to join us for the day, to get in some winter photographing. This was the third time I've met up with Sean, the first being on Cedar Lake early last summer and the second on Little Island Lake back in the fall. True to form as he approached we heard his familiar "giddy-gig" call. As always, Sean was full of fun and energetic stories, and true to his word arrived just in time for the morning coffee. Sean arriving for morning coffee. By 10:00 we started packing up camp, which took a considerably less amount of time then setting up, and we were all off, heading back to the Visitor's Centre via the eastern lower plain of Norway Lake, by around 11:00 am. The first part of the trek was back trekking over are previous trail, and hence was easy, followed by about 300 meters along a freshly made trail that Mike had made while we slept that morning; thanks Mike! However after that it was a brutally difficult hike back to the highway, as we were passing through between 2 and 3 feet of fresh powdery snow. We all took turns breaking the trail, a killer job by any standard, but by the time we reached the base of the Visitors Centre, and we knew we would have to change our strategy. Looking back on our trail....looks so easy now. It was at this time that Markus suggested changing up our approach to breaking the trail, suggesting that one of us break the trail full time, a killer job, while the last to follow along the trail (and hence having the best groomed trail to follow) pull two sleds. At first this seemed like a big challenge for the puller of two sleds, but Jeffrey M was up for the challenge, and stated that it wasn't that hard to pull two sleds, as the trail was well packed by the time he was on it. Great show Jeffrey. In the end, it was Shawn of North Bay that cleared the trail followed by Markus, Mike and I with our sleds and then Jeffrey M at the tail end of our group towing both his and Shawn's sleds. In all, the rest of our trip while still challenging was easier then the first portion, and we were back at the point where the Visitor's Centre access point road meets highway 60 in about an hour after changing up our trail breaking, or about 2.5 hours after leaving camp. One nice treat to our return to our cars was that Sean of Ajax had left his car parked at highway 60 and the Visitor's Centre access road, saving us a further kilometer walk to our cars, as he drove Mike, Shawn and I to grab the cars, while the others watched the gear. There's always time for a few photos! Our trail from the Visitor's Centre. You see, Markus, and Sean stayed behind and chilled a bit longer taking some extra shots, and were rewarded by seeing a small pack of wolfs following along the trail that we had just carved out in the canyon below the Visitors Centre's main deck. I was really happy that Markus and Sean got to see them, but will admit that I had wished I hadn't of been in such a hurry to return home, for wolf sightings are rare at best. (See Markus's thread on Algonquin Adventures for details and Sean of Ajax's video clip of the sighting) Oh well, I guess I have another reason to go back to the Park; like I needed one. 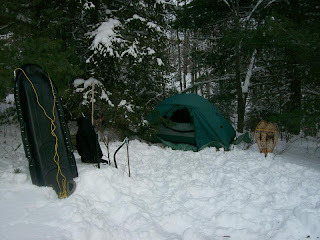 All in all, I can honestly say that winter camping can be a lot of fun, provided you are well equipped and traveling with experienced and like minded people. Traveling with Markus, Mike B, Shawn and Jeffrey M gave me the perfect combination of both, and I am anxious to try the park out again next winter. For those interested tip logs written by Mike B, Shawn of North Bay, and a mini log by Markus are also available. As well, some interesting chat about my iPhone message, and watching the trip "live" via the net and SPOT can be found here. For now though I counting the days to the Spring Opener; 8 more sleeps! While I have eaten a portion of bear when I was young and it tasted much like pork. I have given up eating meat because the animals mean more to me alive!!! smile in life. I would have wanted to keep one of those babies also! If you like Proppe's Paddles, consider making a donation! This Site is for my children, Joshua and Liam. In putting these stories here it is my hope that they will one day be able to look back on all the good times we have been blessed to share and smile. © 2011, ProppeShopp.